Solid State Drives (SSD) are faster, silent, more expensive and sometimes more complicated to maintain than conventional platter based hard drives. Especially the maintenance of the drive is a factor that may keep users away from purchasing a drive, or frustrated if they find out that their SSD does not support TRIM or garbage collection. Why is that bad? Because it means that the performance of the drive will drop over time. The majority of SSDs that are currently sold support TRIM or can be upgraded to support it. But Trim is not supported on all operating systems. At the time of writing, only Windows 7 and Windows Server 2008 R2 support it on Windows. Samsung's SSD Magician Tool has been released as a English beta version. The tool offers system information, performance optimization, firmware updates, data cloning and performance benchmark for Samsung Solid State Drives. The utility detects connected Samsung drives automatically and blocks some of the program's functionality if no drive is detected. System Information: Displays detailed information about the computer system and the disks that are connected to it. Performance Benchmarking: Only works on Samsung SSDs. It can be used to test the performance of the solid Sate drive. The test range and I/O size can be defined individually. Can be scheduled to run regularly. Performance Optimization: Only available if a Samsung SSD is connected to the PC. This basically runs garbage collection on the drive to improve its performance again. Only necessary if it does not support Trim or runs on an operating system that does not. Can also be scheduled to run regularly. Firmware Update: Offers to create a bootable USB Disk that can be used to update the SSDs firmware. The firmware file needs to be downloaded separately from the Samsung homepage. Date Clone: The feature is not implemented yet in the beta. Samsung's SSD Magician Tool is especially handy for users who run an operating system that does not support TRIM as it offers to maintain the drive to keep the performance of it near factory levels. The ability to run the garbage collection regularly means that it is possible to automate the process. The feature set is different in some aspects to comparable tools like Intel's SSD Toolbox. Intel's application supports operating system tweaks to optimize the system for SSD usage. Samsung's software on the other hand offers a performance benchmark that Intel's tool does not offer. 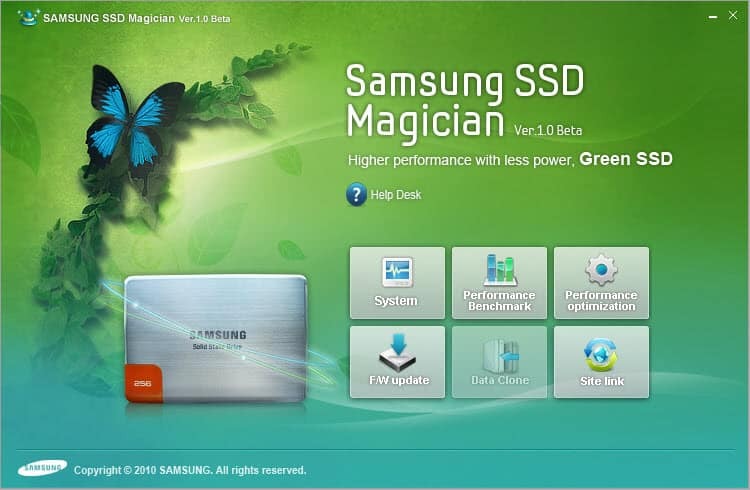 The Samsung SSD Magician Tool is available for download at the project website. The very same page contains firmware downloads and installation help files. the trim wouldn’t enabled obviously,i leave it like that, i rely on the garbage collect. now i heard that the garbage collection from samsung work in NTFS mode and are inefficient for an Apple who used HFS ? is it true ? This is chinese for me ! i need advice should i enabled the trim or should i just leave it like that ? i have a PC at home so i can sometimes used the magician software from samsung to optimized the drive. thank you for your attention from Denis, have a good day. Working Samsung SSD 256 GB 800 Series is displayed but not recognized by Samsung SSD Magician utility.